Ramesses II (Ramses II) was a pharaoh of the Nineteenth Dynasty, the second dynasty of ancient Egypt’s New Kingdom. He was born around 1302 BC, and succeeded his father, Seti I, in his late teens or early 20s. Ramesses II reigned for a total of 66 years, making him one of the longest reigning pharaohs in the history of ancient Egypt. He outlived many of the children he fathered. Incidentally, this record was surpassed only by Pepi II, a pharaoh of the Old Kingdom who is recorded to have reigned for 94 years. Apart from his long reign, Ramesses II is notable also for various achievements during his lifetime. For instance, he campaigned successfully against the enemies of Egypt, including the Hittites in Anatolia and the Nubians to the south of Egypt. Additionally, Ramesses II constructed many remarkable monuments that have survived till this day. Amongst the best-known of these are Abu Simbel and the Ramesseum. After the treatment, further examinations were carried out on the mummy. It was found that the pharaoh was about 1.7 meters (5 feet 7 inches) tall, had fair skin and red hair. In addition, some of the maladies the pharaoh suffered from were identified. For instance, it was reported that he was suffering from arthritis, as well as a tooth abscess. Moreover, it seems that Ramesses II also had ankylosing spondylitis, a long-term inflammation of the joints of the spine, which would have made him walk with a hunched back during his later years. After the analyses of the mummy were completed, it was flown back to Egypt and returned to the Cairo Museum. 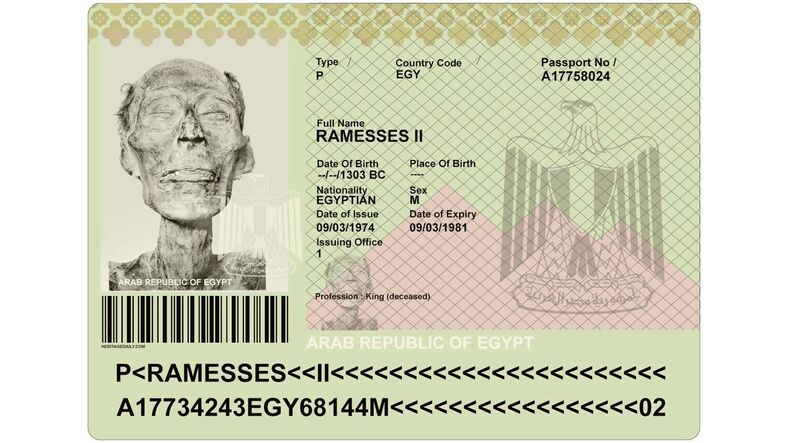 Top image: A mock up for the only mummy with a passport. Hey Ramesses One One, you look like sh*t; what's your "secret"?